I had a deep desire to connect with veterans to offer my love and light. I wanted to show my respect and learn about their journey. 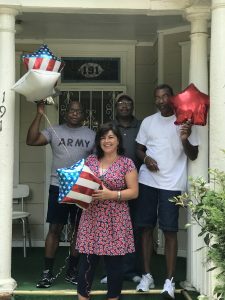 I used Independence Day, July 4th as a platform to ask a few organizations if I could visit with the veterans. One particular establishment responded to my request to bring refreshments and offer my love to the service men who have had struggles. During my two hour visit, I shared my experience studying the Tao and they allowed me to offer the group of five men a Soul Song blessing. We enjoyed our time together and felt like old friends. The response was wonderful. I heard afterwards from the Director, that they really enjoyed my visit and wanted me to return. Love you, Claudia and thank you for your love for those in need.